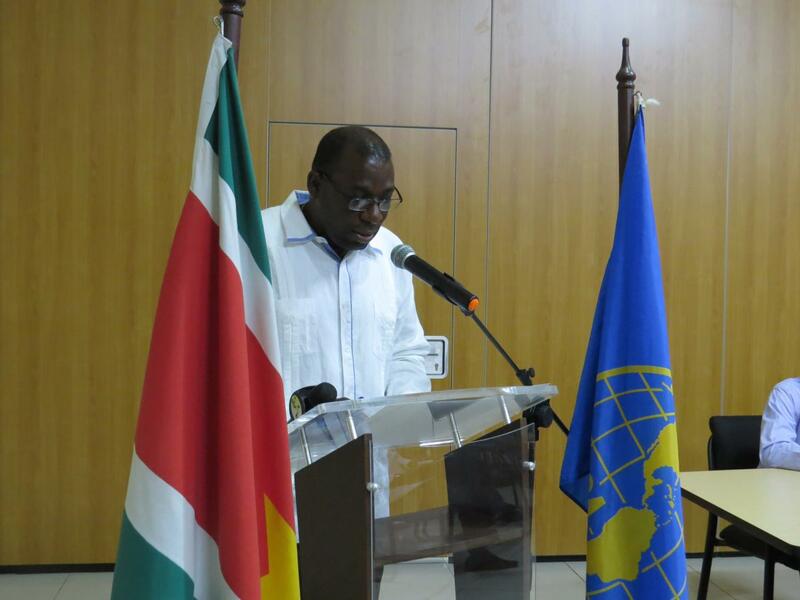 The Representative of IICA in Suriname, Curt Delice, presented IICA's Medium Term Plan (2018-2022) and the main results achieved during 2018. Paramaribo, Suriname, 9 April 2019 (IICA). Women producer associations, rural youth and technical staff from the public sector were the main beneficiaries of actions by the Inter-American Institute for Cooperation on Agriculture (IICA) in Suriname in 2018, which it is hoped will increase the country’s resilience to climate change and strengthen its agribusinesses. The technical cooperation that IICA provided to the Surinamese agriculture sector focused on technology transfer and the development of production capacities to equip small producers with the necessary tools to access markets and to improve natural resource conservation. Infrastructural projects such as the construction of water harvesting systems, supported by the Institute and implemented in the previous year, have now enabled a more effective response to prolonged drought events and ensured that more than 200 members of the Maroon indigenous community have access to potable water during periods of low rainfall. Deepak Jairam, Permanent Secretary in the Ministry of Agriculture, Animal Husbandry and Fisheries of Suriname, remarked that, “We applaud the work of IICA, which has become an indispensable partner of the Ministry, assisting it to further its objectives and to develop the community. Furthermore, we believe that these models can be replicated in other parts of the country, which are also experiencing the negative effects of climate change”. In order to ensure that the country derives maximum benefits from the new water harvesting infrastructure, IICA and the Regional Center for Integrated Services in Protected Agriculture (CRESIAP - Spanish acronym) of Guadalajara, Mexico, trained small-scale Surinamese vegetable farmers in the use of protected environments. Vegetables are a non-traditional crop in the Caribbean, and therefore represent another option to bolster food security and expand trade opportunities. Gradually expanding Suriname’s supply of agricultural products will be critical to this objective and is the reason for the introduction of Perone beehive technology to the country and for the training of rural communities and technical staff of the Ministry in the sustainable use of its by-products, lowering costs and improving productivity. Jairam emphasized that, “This project increases the sustainable production of honey and contributes to the recovery of coastal mangrove forests, which are fundamental to combatting rising sea levels”. In addition to actions to diversify and increase production, other activities were geared toward improving the quality of goods and boosting intraregional trade. During the year, IICA organized training sessions on issues related to value added production and facilitated the participation of producers in fairs. For example, Caribbean Week of Agriculture in Barbados gave them the opportunity to display and sell their products. Curt Delice, IICA’s Representative in Suriname, revealed that, “In 2019 we will work to promote and develop local agricultural capacity in climate smart agriculture, sustainable production systems, productivity improvement, natural resource management, and the development of value chains in family farming, as well as to assist young people and women in agriculture to strengthen their organizational capacity”.